The Polish Ex-Combatants’ Club at 11 Drummond Place in Edinburgh is to be renovated; works have started and the building will reopen as a revitalised cultural centre in 2020. 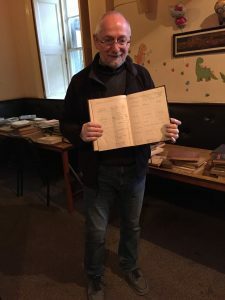 The building was first purchased by Polish soldiers in 1948 and after 70 years the collections of books, pictures, documents, photographs, etc provide a snapshot over that time. The first sorting has commenced and discoveries being made of publications which excite interest. During 2019 the selected material will be assessed, catalogued and conserved before being returned to the new centre or dispersed to relevant libraries. 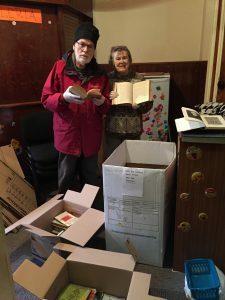 Jenny and Stuart Robertson, Tom Bacciarelli and I made a start on November 26 but we have three rooms of books to sort through so it will take some time, especially when a special find starts a conversation and we then have to remember to return to our task!